An aftershave balm is the key component in assuring that freshly shaved skin is properly healed and moisturized. So that’s where the Pure & Natural Aftershave Balm (previously October’s 2011 – POTM) comes into play! 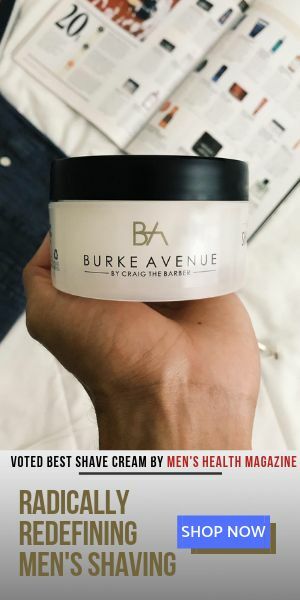 With over 30 years of experience in the field of barbering in the United Kingdom, Master Barber – Ian Kane owner of The Village Barber product line, has seen his share of shaving irritation. So with that in mind, he successfully created an aftershave balm that can stand up to the challenge! Great fragrance, all natural, chemical/paraben free and filled with more essential oils than you can count. And the best part, it works well! What more do you need? Get it! This balm makes the face feel so good after shaving. brilliant! I have tried the shaving oil and the after shave balm. I must say that they are tops in my book. Great shave; great soothing balm and great scent. Best shaving balm on the market! Together with the shaving oil, it makes the normally dreaded shaving experience much more enjoyable! Excellent after shave balm & shaving oil. Use them all the time now. Thanks everyone for your great comments! It is always a pleasure to hear (and see!) the comments from those who have tried my products, and particularly those whose shaving experience has been greatly enhanced by them. Happy Shaving!! I started using The Village Barber products about a year ago when I was suffering terrible skin soreness through my usual shaving routine. After a couple of applications on the shaving oil and aftershave balm my skin started to feel great. I wouldn’t use any other product on the market now! Congratulations on the well deserved accolade for your shaving balm. I’m a true convert and now look forward to shaving using not only the balm but also the shaving oil. I bought your oil and balm for my partner and sons after a recommendation from a very satisfied customer. My partner and boys will now use nothing else. I have been using the Village Barber balm and oil for over 3 years now and my face is so soft and smooth my wife can’t keep her hands off my face. Really like the smell of the balm, very pleasant aroma. I highly recommend that every man try these products for themselves and see how your woman responds. Not surprised this balm was voted the best for 2011. Just tried the VillageBarber shaving oil and shaving balm and was very impressed by the quality of these products.Definitely worth trying.Will use again. Thank you Steve, I appreciate the feedback!